In this post we’ll give you some tips to increase your online reservations using your Facebook fan page and Salon Booking plugin. We are pretty sure that most of you have a Facebook fan page where you work daily to increase your fans numbers and try keep them engaged and hope that one day they’ll become customers. Or more simply a Facebook fan page is a tool to keep in contact with your customers, right? Well I don’t know how many of you are aware that Facebook allows you to add a button on top of your page. Well you can choose among different kind of buttons. As your main goals is to increase your reservations the ideal is to choose “Book services” button. Once you selected this option Facebook will ask you to provide an URL where your customers can make a reservation. If you are already using Salon Booking plugin you could provide the URL of the page where you placed the booking form. Once done click on “Add button”. That’s it. 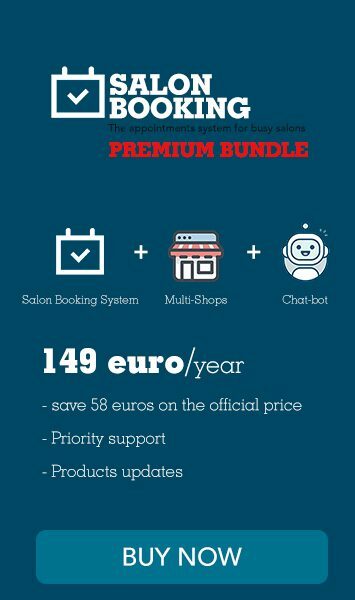 This way your fan/customers will be aware of your online booking service and for them will be very easy to make a reservation through your website using Salon Booking plugin. In the next version of Salon Booking we’ll add a “Login with Facebook” option. This brand new feature will make very easy for your customers make reservations on your website as they don’t need to login every time as they will be already logged with their Facebook account. Do you think this tips could be helpful for your business too? P.S. Do you know that we’ve launched a brand new add-on called Advanced Discount System? Take a look..